Hope you all had a happy Easter weekend. We spent Saturday in Asheville, walking around, stopping in a bookstore, a gallery, and a brewery with the in-laws. It's amazing what a few days away can do. It's refreshing to turn the smart phone off (unless we needed directions), and do nothing but talk, walk, eat, and sleep. We had dinner at Mela, an excellent Indian restaurant on Saturday night. It was then that I realized there are two camps: bread people and condiment people. I fall into the condiment camp, my husband into the bread camp. As everyone was enjoying the pappadum sans chutney, I was using it to scoop up (a lot) of mint cilantro chutney. This has also occurred at home, when I found myself standing at the kitchen counter with a spoon in the jar of romesco, raita, and recently in this harissa. I've seen a few recipes with harissa over the past year and I finally made my first batch. I made Luisa's recipe, (see above for my exact changes) substituting chipotles for New Mexico chiles and adding the entire roasted red pepper. My sun-dried tomatoes were tiny, so I added about six in total, and used walnut oil (husband allergic to raw olive oil). My harissa wasn't too spicy, I think the walnut oil helped. 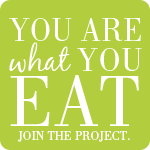 Adding fat—like oils, nuts, avocados, cheese—to spicy foods, reduces the heat factor. 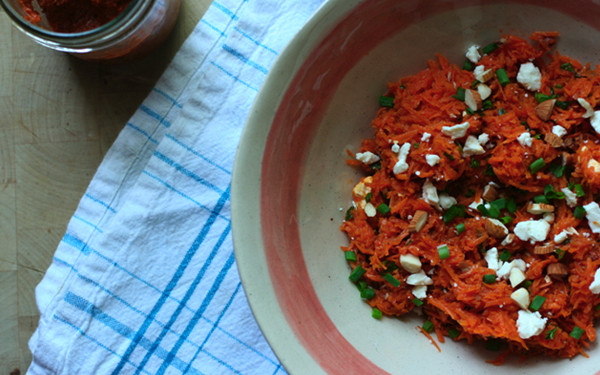 I bookmarked this carrot salad many months ago, because it reminded me of a salad I had on our honeymoon at a cafe in Copenhagen. 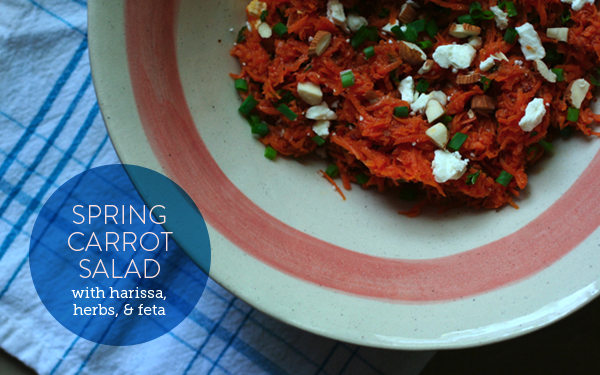 A chilled carrot salad with smokiness from the peppers, sweetness from the mint, crunch from the almonds, and saltiness from the feta. We ate the carrot salad with this spring panzanella last night for dinner. It was perfect. 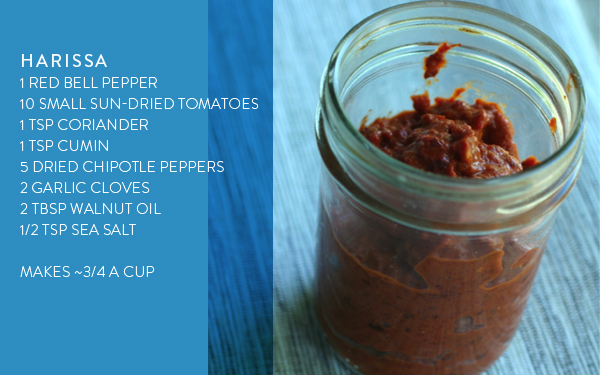 Oh and you'll have some harissa leftover, so mix it into scrambled eggs, slather on roasted potatoes, or on your next grilled cheese. Put the grated carrot into a large bowl. Heat the olive oil over medium heat. Once hot, add the garlic. When the garlic is fragrant, add the harissa, stirring frequently. Turn off the heat. Add the lemon juice and pour over the carrots along with the herbs. Mix well. 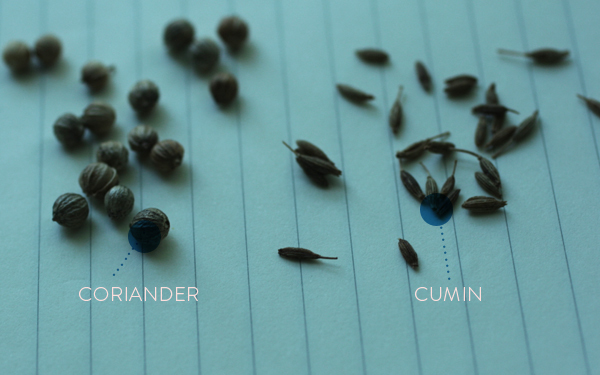 Refrigerate for at least an hour so the flavors meld. Garnish with almonds and feta before serving. I think feta and harissa automatically make any dish 10x better. I've never made harissa before. I'll have to give it a try! I've never tried harissa before but by the sounds of all the things that are in it, I know I will love it. This salad looks great! I wonder what walnut oil tastes like on a salad?